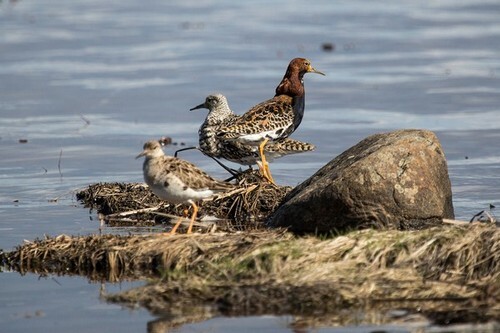 The watchers noticed the first waders in the vicinity of Novosibirsk. The first waders-carriers settled in the ponds of Kainskaya Zaimka and in the floodplain of the Lower Eltsovka. Carriers are small brained birds that can fly from shore to shore river or pond with a loud scream, wings almost touching the water, told the correspondent NGS fellow, Institute of systematics and ecology of animals, SB RAS Alexei Yanovsky. The most pugnacious and prominent among waders — ruffs — appeared on the marshy outskirts of the City near Novosibirsk. These Northern birds will hold in Novosibirsk a few weeks on the way to their breeding grounds. “Ruffs is pheasants among migratory wild birds. Ornithologists believe that it is impossible to meet two similar ruffs among the thousands of photographed birds,” — said Alexey Yanovsky. Many waterfowl have returned after April 30, when the city’s waters have gone past the ice. On the Islands of the Ob reservoir settled a couple of sea Kulikov-forty that feed on the river “mussels” — the largest freshwater molluscs-mussels. On the lakes of the Novosibirsk region ornithologists have observed black-winged stilts and avocets from the red book of Russia. The first swans arrived in the vicinity of Novosibirsk in mid-April. Massive arrival of waterfowl and other bird species began simultaneously with the opening of the rivers and melting ice.